I went ringing again at Alba Marsh with Brendan at the weekend and just as last week I flushed a Reed Warbler into the nets walking out after having put up the second net. This bird looked quite yellow on the under-parts and more greenish on the upper-parts than our normal Caspian Reed Warblers so we checked it carefully to see if it might be a Marsh Warbler. Using all the data available including the Wallinder method the bird turned out to be Reed Warbler. We caught anther five Reed Warblers, three being the greenish birds as the first one and two being our normal Caspian Reed Warblers (fuscus). 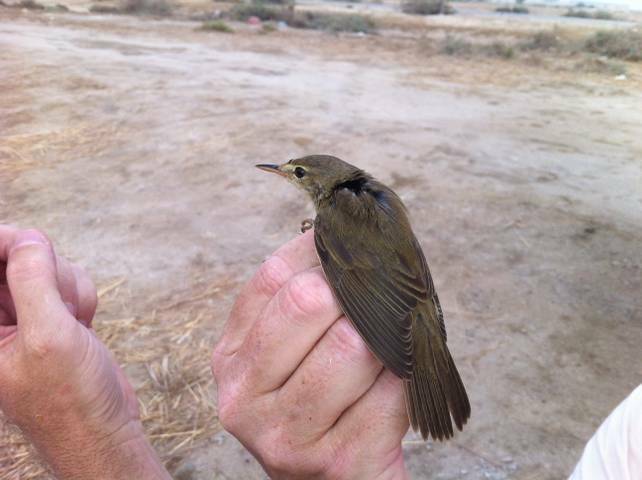 The wing measurements of these birds also differed, with the Caspian Reed Warbler having wing measurements of 64 centimetres and the greenish birds having 67 – 71 with an average of 68.5 centimetres. We are only meant to get fuscus in Bahrain and the Eastern province of Saudi Arabia but these birds may show a second race passes through in May. We will keep a check on these birds over the next few years to see if I can get and firm data on what they are. Another interesting fact concerning these Reed Warblers is that one of the fuscus Caspian Reed Warblers had either a brood patch or was juvenile just out of the nest. 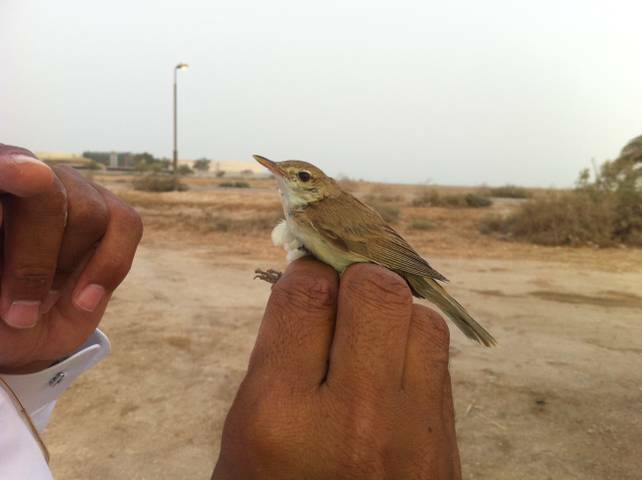 This species has not been recorded breeding in Bahrain and has just been recorded as a passage migrant, but this bird indicates that breeding may occur at Alba Marsh. Again we will keep an eye out and continue ringing in the summer at Alba Marsh to try to find out if the birds are breeding here or not. Unfortunately, although I took my camera with me, I left the card at home so was unable to take photos of the birds caught, and Brendan, who has just bought himself a new camera left his at home as he was looking at how to operate it and forgot it. As a result the only photos we could manage were with Brendan’s I-Phone and I thank him for permission to reproduce a few.